by John Bew (New York, NY: Oxford University Press, 2017). Having just presided over Britain’s victory in the Second World War, Winston Churchill had believed he had little to fear from the Labour Party challenger, Clement Attlee, who had served as his deputy prime minister throughout the war. While he respected the Labour leader (the two were personal friends), Churchill clearly regarded Attlee as a figure of little stature or significance. He was, in Churchill’s memorable phrase, “a sheep in sheep’s clothing” – as meek and unprepossessing in reality as he was in appearance. Yet the results of the 1945 election demonstrated, not for the first time, that Attlee’s opponents had greatly underestimated him. 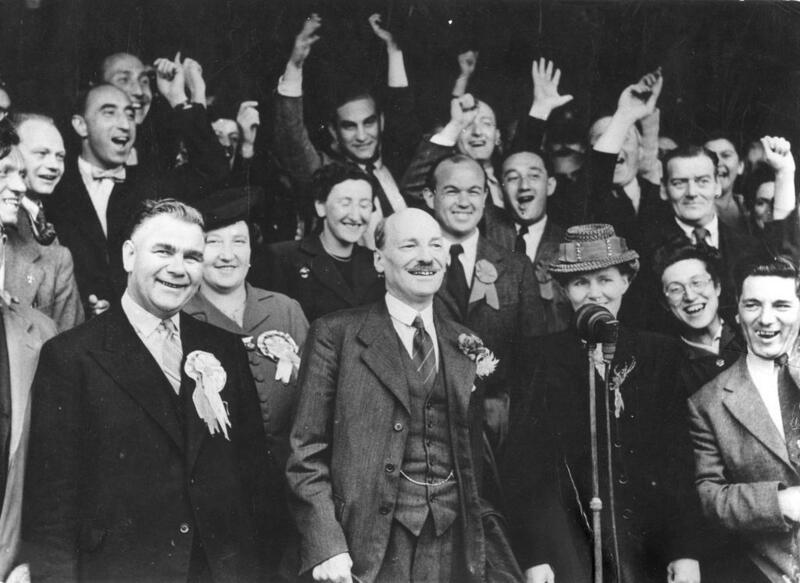 Out of the Wilderness: Attlee (front, center) celebrates victory in the general election, July 28, 1945. It was the first general election in ten years; in 1931, the Labour Party had seemed on the verge of collapse. Swept into power in an electoral landslide – the Labour Party emerged from the 1945 election with a commanding majority in the House of Commons – Attlee achieved what no other Labour leader had done before. For the first time in history, the United Kingdom would be led by a majority government dedicated to socialist principles. During his six-year premiership, Attlee would make effective use of the Labour Party’s dominant position, bringing about changes in British politics and society that were nothing short of revolutionary, including the creation of the National Health Service and the granting of independence to India and Pakistan. As John Bew’s biography makes clear, Attlee’s apparent weaknesses as a politician – he was not a great public speaker and had little charisma - concealed very real, albeit less dramatic strengths, which fitted him perfectly for his role in leading the Labour Party to power. Attlee’s background marked him as a somewhat atypical Labour leader. He was neither a leftist ideologue nor a trade unionist. The Oxford-educated scion of a middle-class household, he embraced socialism only in his late twenties. Embarking on a career in social work in the slums of East London, he came face-to-face with the ugly reality underlying Britain’s imperial splendor. Attlee came to see socialism as a means of making Britain live up to the very best of its ideals. Though he held a lectureship in economics at the London School of Economics for a time, Attlee’s sense of purpose derived not from a dogmatic adherence to Marxist ideology, but rather from his dedication to bringing about a practical improvement in living conditions for all Britons. This purpose would sustain Attlee’s efforts throughout his career in politics. Attlee’s political ambitions received a very important boost in the form of his service in the First World War. Unlike his brother Tom, a pacifist who refused out of principal to participate in the war effort in any capacity (and who was imprisoned as a result), Clement Attlee used a student’s family connections to gain a commission, despite his somewhat advanced age (he was thirty-one), shortly after the outbreak of war. He served in Gallipoli and in Mesopotamia, before returning to the Western Front in France in 1918. Under Attlee's direction, the Labour Party's position on foreign affairs in the 1930s was somewhat inconsistent. A believer in the "collective security" represented by the League of Nations, Attlee opposed rearmament even as he pushed for firmer measures against Nazi aggression. His honorable service gave Attlee, who was for many years known as Major Attlee, or simply as “the Major,” a considerable advantage, especially among moderate voters. Attlee’s respectable bourgeois demeanor, and his skepticism of utopian theorizing, enabled him to appeal to a section of the electorate that would otherwise never consider supporting a Labour candidate. At the same time, his serious and practical promotion of socialist reforms, not to mention his earnest and unpretentious personality, allowed him to count on the support of the Labour Party’s base. Even the Conservative press was compelled to admit Attlee’s essential decency. The explanation for Attlee’s success seems to have less to do with his obvious superiority as a leader than with his lack of effective rivals. The Labour Party, as a relative newcomer to British politics, simply lacked a deep bench of talented politicians. Attlee was one of a handful of capable figures left to guide the party. Appointed as deputy leader, Attlee became party leader in 1935 almost by default. As Bew notes, “at no stage had Attlee lobbied for the job” (194). Few in the Labour Party seemed to regard Attlee’s leadership as anything other than a stopgap. Most of the Labour Party’s leading lights had been voted out of office in 1931; once they had regained their seats in parliament, it seemed inevitable that Attlee would step aside. Much to everyone’s surprise, Attlee’s included, he would remain in power as the head of the Labour Party for over twenty years. While the Conservatives still held a parliamentary majority in the summer of 1940, their position was undermined by the unpopularity of the prime minister, Neville Chamberlain. Realizing that a single party could not call upon the tremendous exertions that would be required of the British people to win the war, the Conservatives opted to enter into a wartime coalition with Attlee’s Labour Party. To his credit, Attlee accepted this invitation, taking up the position of deputy prime minister. He remained in that post throughout the years of WWII, serving as a member of the War Cabinet and acting in Churchill’s stead whenever the prime minister was away. The New Big Three: Attlee (left) with Harry Truman and Joseph Stalin at the Potsdam Conference, following the Labour Victory in the 1945 general election. Now as prime minister, Attlee was forced to respond to the international crises of the early Cold War years. He attempted to build on Britain’s wartime “special relationship” with the United States, forming a close defensive alliance. At the same time, he sought to promote a renewed dedication to “collective security” in the form of the United Nations. Attlee also had to manage Britain’s decline as an imperial power. Since the interwar period, he had been sympathetic to the cause of Indian independence. As prime minister, he sought to grant India independence on the fastest practical timetable. While Indian independence was not an entirely smooth process, its handling by the British government was, in Bew’s view, to Attlee’s considerable credit. Certainly, this was one area in which Attlee was by far better suited to the task than Winston Churchill. Had Churchill remained in power, Bew speculates, it is possible that his desire to preserve British rule over India would have led to the outbreak of an insurgency, or perhaps outright civil war. Domestically, Labour’s accomplishments were equally dramatic. The establishment of the NHS, the expansion of National Insurance and the nationalization of key industries were all accomplished with remarkable efficiency. While concern over Britain’s balance of payments and diminished production led Attlee to maintain wartime rationing well into the postwar period, the popularity of the expansion of the welfare state helped Labour to maintain its parliamentary majority after another general election in 1950. While the crisis brought about by the Korean War contributed to Attlee’s fall from power in 1951, the Labour Party remained the principle opposition party in parliament, and was well-positioned to resume power again in the not-too-distant future. For his part, Attlee remained the leader of the Labour Party throughout Churchill’s second stint as prime minister, resigning, in part due to his advancing age, in 1955. Attlee was not a dynamic and charismatic politician, and in his public appearances he often did seem to match Churchill’s description of a “sheep in sheep’s clothing.” Yet Attlee was much more than this. Perhaps his most important quality was as a conciliator. He led not through forceful example but rather through careful and judicious mediation. He knew how to get the most out of the Labour Party’s often fractious and temperamental intellectual leaders. "All Behind You, Winston": David Low cartoon from the Evening Standard, May 14, 1940. Attlee is in the front row, second from the left. A copy of the cartoon "was Attlee's prized possession..."
Simultaneously, Attlee’s honesty, reasonableness and lack of pretention enabled him to rely on the support of the greater part of the Labour Party’s membership. In fact, polls frequently showed that the British public approved of Attlee significantly more than they approved of the Labour Party. For these reasons, it is hard to imagine that any of Attlee’s admittedly more brilliant contemporaries in the Labour Party could have achieved more than he did as prime minister after WWII. Attlee’s accomplishments as the leader of the Labour Party made that party the force that it was in British politics after the Second World War. One of Bew’s few faults as a biographer is that his obvious sympathy for Attlee makes him something of an apologist for Attlee’s mistakes. For example, Bew deals very mildly with Attlee’s contradictory views on foreign policy during the late 1930s. 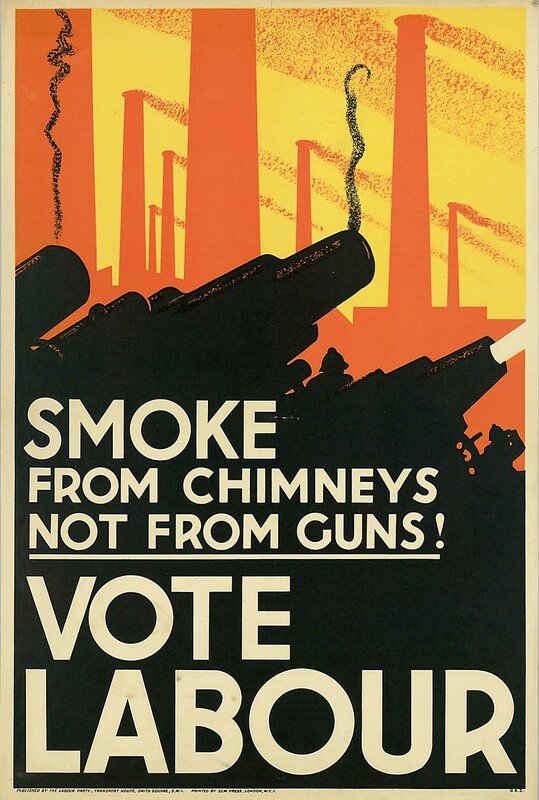 Under Attlee’s direction, the Labour Party consistently opposed rearmament, even as it advocated for a more assertive policy against Nazi Germany and Fascist Italy. This is a relatively minor point. Bew’s work represents an admirable, and comprehensive, examination of a major political figure whose qualities and accomplishments have too often been overlooked.